Financial technology – commonly known as Fintech – is actually not a new thing. Since the development in digital technology grew rapidly, finance industry is already starting to get a lot of attention and noting a significant progress. People’s habits in using the Internet, gadgets, and living practically has forced each line of business to consider the development of their technology. With so many startup companies and non-bank institutions that emerged in the last decade, banking institutions are also competing to be able to gain the market share. Financial institutions that handle online loans, non-cash payments, as well as venture capitals – they are making the bank industry to start thinking about new ways to compete, other than in a currently running conventional way. At WGS we have seen banks beginning to initiate the development of online applications such as e-money and e-banking. When companies invest in fintech, they are investing for the future. As we can see, our future is shaped by how we use the technology nowadays. Right now, we can see people are spending their money into goods, stocks, and technology. Fintech is far more than just investing. Something that’s particularly exciting is all the innovation taking place in the alternative way to spend money. Therefore, we can also see the growth of IT startups in almost every country in the world. In developing countries, fintech startup is a new gateway for people who are bored with conventional banks, which most products cannot reach the middle to lower class – or those in rural areas. 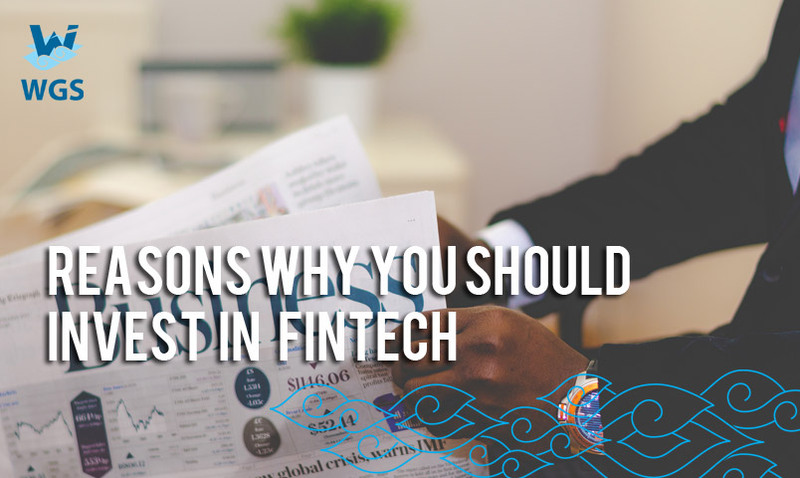 These segments which is actually a captive market can be an investment field for your company to join the fintech industry. Yes, you can’t beat the technology development. We are going way faster than the last decade. Investment in fintech is not just a trial in business. According to the Accenture report, Global investment in financial technology (fintech) ventures in the first quarter of 2016 reached $5.3 billion, a 67% increase over the same period last year, and the percentage of investments going to fintech companies in Europe and Asia-Pacific nearly doubled to 62%. Traditional banks and other non-bank institutions (or your company) are going to continue to adapt to all of this new competition, which will in turn only prove better for investors. The best part about fintech is that the industry will continue to grow in the coming years. By introducing their own fintech products, it’s going to get easier for you to invest and manage your company growth. As a software development company which helped fintech companies to grow, WGS is ready to help you decide your next move in fintech. We will be glad to discuss about the technology with you, so please do not hesitate to contact us through email at info@wgs.co.id.